Your flashlight flickers across the telltale black eyes of an opossum and you hear its classic hiss as it bares a jagged scramble of teeth at you. It's only natural to wonder what concoction of diseases is bubbling up in that mouth! If you've ever been in this situation, this is the article for you. 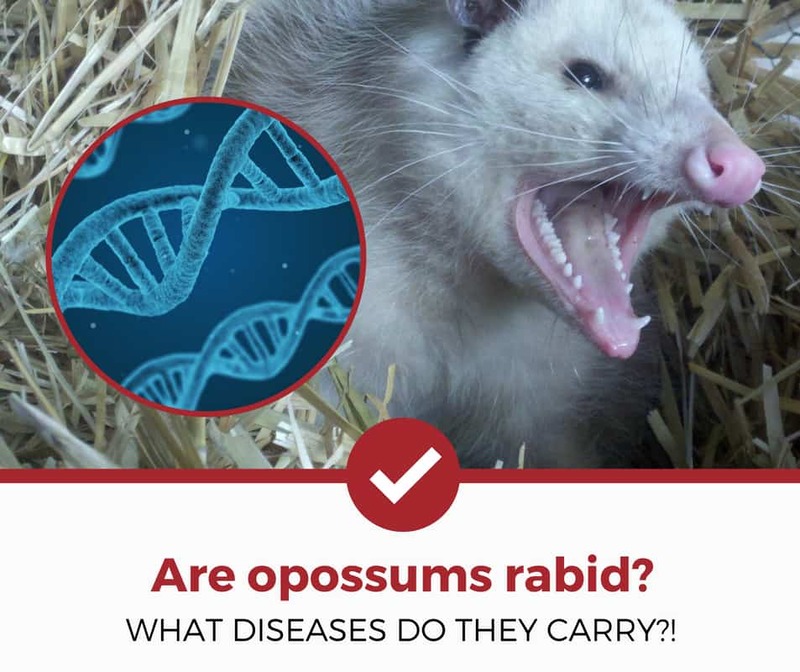 Keep reading for more information on which diseases an opossum can carry, and which ones it can spread to you! Do Possums Carry Major Diseases? So, Do Opossums Carry Rabies? In order to understand how an opossum can contract and carry diseases, it's best to understand the lifestyle of these nomadic, opportunistic feeders. Check out the facts below where we outline how an opossum lives its life in wild in order to get a clearer picture of its disease-carrying profile. Defined primarily as a transient species, opossums never stay in one place for too long. Generally, these animals will create a den and inhabit one particular area for no more than six months. After that, they find another place to call home, even if just for a little while. Why the lack of permanence? Well, it could be because of their shy nature; opossums are reclusive and introverted. Anytime their dens are disturbed by another species, this could mean that it's time to go. Germs lurk around every corner and within every crevasse...especially when dumpster diving is your culinary specialty. These animals don't limit their snacking to garbage, though. Like raccoons, they'll eat anything they can wrap their paws around. This means that sometimes, they'll nosh on another animal which may carry its own set of diseases. Whether or not the diseases pass along to the opossum is a game of chance, but it's safe to assume that eating dirty, sometimes decaying matter leads to some pretty nasty internal side effects. These animals only live for a maximum of about two years in the wild, and for most of that time, they are either sedentary creatures in their burrows, or nomadic in nature, searching for a new place to den. While a temporary home base has been set up, opossums give in to their shy and reserved demeanors. They tend to hide from the outside world and spend weeks or months at a time curled up in the bunkers they've made for themselves raising their offspring. This solitary behavior pattern inadvertently protects the opossums from a variety of diseases that they'd otherwise contract in the outside world. Because they always bare their teeth and drool when humans come around to see them, opossums are considered to be rabid. However, this is simply a defense mechanism! By utilizing this scare tactic, many large predators (including humans) tend to back off, leaving the opossums to their cherished solitude. But do they actually carry rabies? Do these garbage-eaters have parasites? Opossums have a startlingly low body temperature. To be exact, their internal thermometer rests somewhere between 90 and 99 degrees Fahrenheit, which is among the lowest for mammals. Though it hasn't been proven, many scientists hypothesize and agree that this low body temperature sheds some light on something unexplainable: an opossum's uncanny resistance to rabies. It's not impossible for an opossum to carry rabies, but according to the Opossum Society of the United States, the chances are slim. To demonstrate just how harmless these animals are, check out this video below. Wildlife expert Jody Lutz has an opossum literally crawling all over her as she speaks about how rare it is for these animals to carry rabies! Opossums are known as major carriers of a zoonotic disease called leptospirosis, which is a bacterial infection that begins with no more cause for concern than a standard flu. However, without treatment, leptospirosis can attack the kidneys, the respiratory system, the liver, and/or cause meningitis. Transmission of leptospirosis occurs mainly through an opossum's urine and feces in the soil. When animals and humans make unprotected contact with the dirt (for example: if your dog drinks unclean groundwater or you don't wash your home-grown produce well enough), you could risk transmission. How About Parasites (And Their Resulting Problems)? Because of their trash-diving tendencies, opossums are usually afflicted with parasites. However, these parasites are generally the same as one would find on their pets at home—ticks, fleas, mites, and lice. Most of these parasites are just slightly annoying to humans, causing nips and bites along the feet and ankles. However, ticks are the outlier in the list because they carry Lyme Disease, which is deadly if left untreated. Here's some good news: despite the fact that opossums both eat and host ticks as parasites, there is no evidence that they can contract or carry Lyme Disease. When you see an opossum prowling around your yard, there's a cause for concern, but only a slight one. While these animals do carry a strong bacterial infection, the only way to transmit it is via direct contact with soil where they have excreted waste. By taking preventative measures to protect yourself and your pets against environmental hazards, you'll be able to easily avoid any possible transmission of leptospirosis. In terms of rabies and parasites, opossums are shockingly resilient. Despite their short lifespans, these animals are tough against natural pressures, and you don't need to worry that they'll pass any diseases on to you, your family, or your pets.